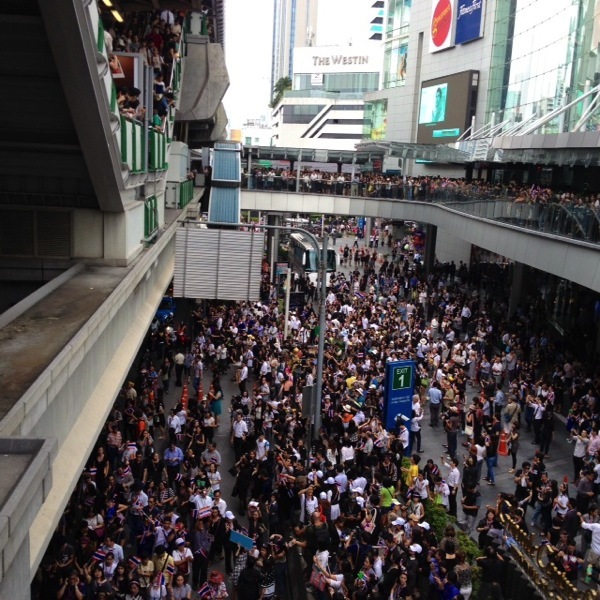 Above are a few photos I snapped yesterday as protesters marched near the Asoke intersection here in Bangkok. 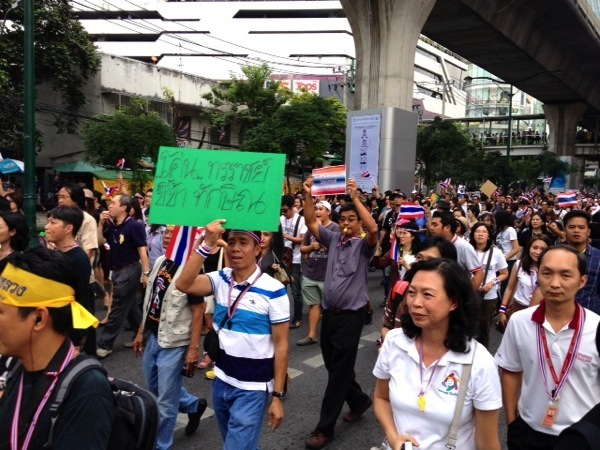 The protests began last week and targeted a proposed amnesty bill that could have led to the return of former prime minister Thaksin Shinawatra. 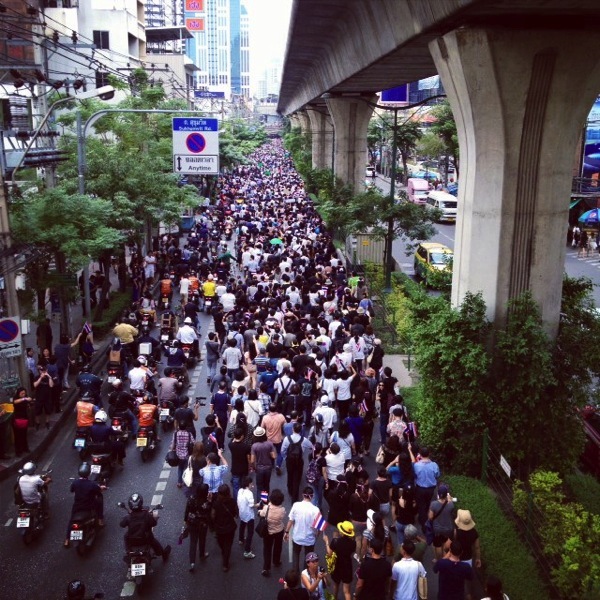 Though the Thai Senate last night rejected the bill, the demonstrations continue. In fact, an opposition leader, Suthep Thaugsuban, has now called for a general strike from Nov. 13-15 (tomorrow through Friday). He called for a three-day closure of businesses and schools to allow people to join the strike; a withholding of taxes that allegedly are used for corruption; the display of the national flag; and the blowing of whistles, which have become a noisy tool of protest, near government leaders. 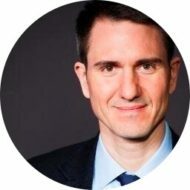 So why are the demonstrations continuing despite the legislation’s demise? For one thing, the lower house can resubmit the bill after 180 days. But organizers surely couldn’t keep rallies going for six months anyway. Instead, the protests aren’t really about the bill anymore. Indeed, a refrain among the demonstrators I saw yesterday was “awwk bpai” (ออกไป), which means “get out.” As in, it’s time for the government of Prime Minister Yingluck — Thaksin’s younger sister, of course — to go. More than 10,000 riot police were stationed around main government buildings near the rallies, which are stoking fears of clashes between rival groups, the kind of violence that has sunk governments in the past. Although the latest protests are the strongest against Yingluck’s government, it is unclear if they are sustainable, especially in view of the overwhelming support that her government has in Parliament. As ever, follow me on Twitter for developments.